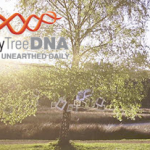 One month ago Family Tree DNA reduced its Family Finder price to $99 with the promise that if we achieved a minimum volume of orders during our Sizzling Summer Promotion, Illumina would help us keep this price moving forward. We are happy to announce that the genetic genealogy community responded in a big way, and thanks to you we are maintaining the price of the Family Finder test at $99. With this announcement, the prices of the major autosomal DNA tests for genetic genealogy — from Family Tree DNA, 23andMe and AncestryDNA — are all the same and genealogists can seriously consider testing with multiple companies to search for cousins in as many genetic genealogy databases as possible. I’ve had the ancestry DNA test done & just got an email offering me tests for more people for only $79 each. Yes, they’re offering that now — and when they institute the tools that the other companies have, it’ll be worth it, too.